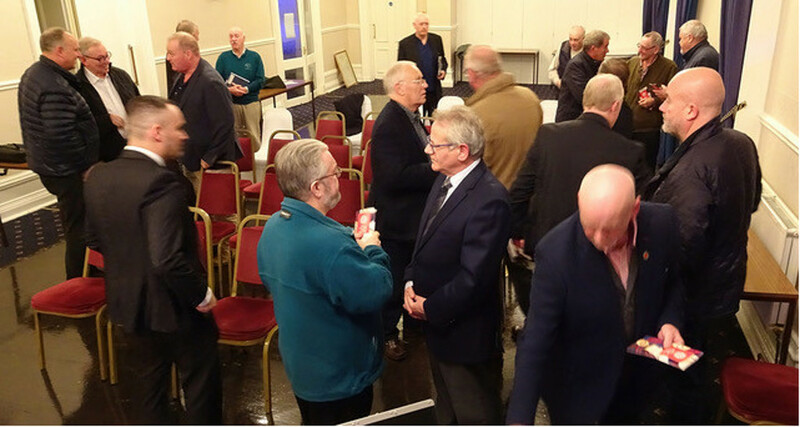 Ashton Masonic Hall recently hosted a Presentation for Lodge Royal Arch Representatives. The team was led by EComp Harvey Basger, the Second Provincial Grand Principal, who gave a very concise and informative explanation of the objectives of the evening in his usual bright and friendly manner. He then handed over to WBro Joe Glass, the Provincial Grand Mentor, who then took those present through a very informative PowerPoint. This gave a vast amount of information of the duties, responsibilities and importance of the role of a Lodge RAR, raising some very important points and questions. He explained the important role played by the Lodge Royal Arch Representatives in the process of introducing Craft Masons to the Royal Arch and encouraging those brethren whose membership of the Order had lapsed to consider re-joining. He also emphasised the importance of making sure that the best person held this particular Lodge office. Clearly, this office must not be seen as some sort of sinecure, a means of getting a Brother’s name on the Summons. It is vital that this office is held by someone who will work hard at this job. After the presentation was complete, EComp Basger and EComp David Dunn APGP, then conducted a wide ranging and probing Question and Answer session. The meeting was then closed by EComp Gerry Hodson, the APGP for the Southern Area. The discussions continued over coffee for some time following this very interesting and successful briefing. Words and Pictures are ©Kevin Hall, District Communications Officer for Ashton & Mossley District. Unauthorised use of either words or pictures for commercial gain is forbidden.